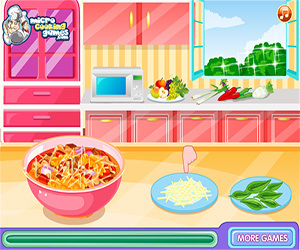 Lasagna Soup is a game that will entertain you a lot! 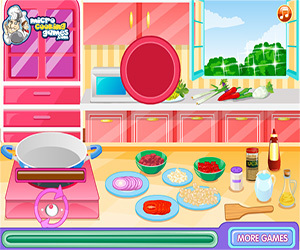 Try this to find out how to prepare a delicious lasagna soup! It's very simply: just follow the in-game tips! First, you have to get your minced meat: cut meat slice with your knife to obtain little meta cubes. You have to do the same with tomatoes (cut them in slices), chili peppers (in cubes) and with an onion (in slices). Now you have to use the grater with your cheese. Grate it all! It's time to use the burner! Turn it on! Put a pot on it and add oil, meat cubes, spicy cubes, onion and tomato slices and some pepper. Now mix all this stuff together. Add some water, salt and tomato sauce. Now mix again! Turn off the cooker. Your lasagna soup is almost ready! Just add the grated cheese and some basil leaves. You can now eat your lasagna! Enjoy it now!